Anytron ANYBLADE is a state of the art digitally-operated die-cutter. It’s precision and customer-oriented design makes it the perfect label cutter for the home or office space. The user-friendly interface allows for seamless and efficient operation, and not having to retool enables cutting on the fly at any size. It’s the one-stop solution for laminating, matrix removal and slitting simultaneously. The Anytron ANYBLADE is a heavy duty blade finisher. 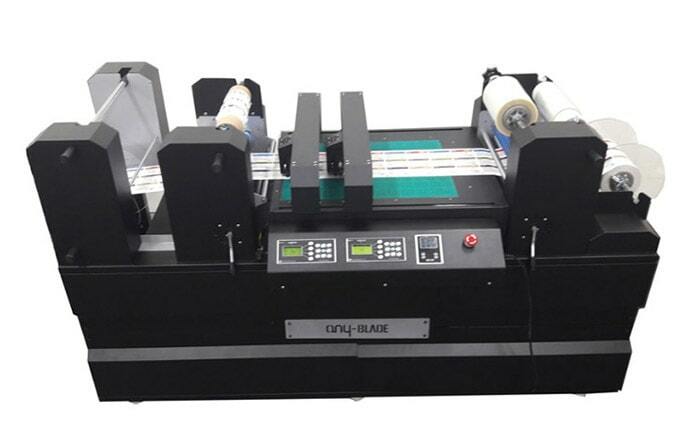 It allows for digitally die-cutting, laminating, slitting, and rewinding of even the heaviest roll materials. Using proprietary software, the ANYBLADE holds extremely tight tolerances, allowing the user to set up their cut file and walk away. The addition of a second cutting head allows for increased cutting speeds of smaller labels. Without retooling and stockholding, labels can be cut on demand to any proportion. It’s simple and easy to operate the ANYBLADE, no previous technical skills necessary! Completed labels can be easily wound with two rewinders. Cutting can be done anywhere thanks to ANYBLADE’s portable design. Detects up to 4 black marks for accurate registration, avoiding any synchronization issues. Each modularized part can be assembled and added for an all-in-one process. Paper, film, and even metallic! Cutting Area: 13.7" x 19.6"